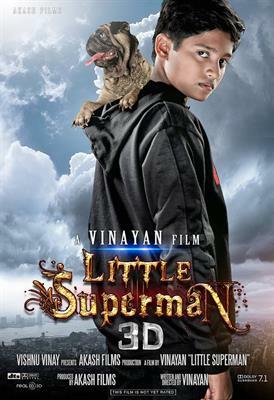 After the grand success of Dracula 3D, director Vinayan is back with a magnum opus titled 'Little Superman 3D'. Deny, selected from 30,000 applicants would play the title character. Exclusively shot at locations set at Afgha¬nistan, Kochi and Alleppy, the movie would start rolling in August. M.Jayachandran would lend his hands to tune the song which could be an audio extravaganza. Heard from the grapevine, Rs 2 Crore will be exclusively spent to bring the graphics of Little Superman 3D to international standards. To be released in Malayalam, Tamil, Telugu and English, this fantasy movie would reach theatres in 2014. 'Little Superman 3D' revolves around the life of a child who receives supernatural powers while inside the womb of his mother. With the storyline influenced from the Puranas, this would be a fantacy movie having all the commercial elements like love, humour and action. Along with Bollywood actors Jackie Shroff and Om Puri, Tamil star Nassar, two actors from Hollywood will be seen in the movie. A couple of technicians who had worked behind the movies like Harry Potter Series and Avtar have been roped by the director to add more graphics for 'Little Superman 3D'. Vinayan had already proved to be a successful film maker who made his directorial debut with Super Star in 1990. His notable movies are Vasanthiyum Lakshmiyum Pinne Njaanum, Karumadikkuttan, Oomappenninu Uriyadappayyan, Dada Sahib, Vellinakshatram, Aakasha Ganga and Albhuthadweep. Dracula 3D was taken on shoulders by the audience as the movie gave the 3D experience, much rare in malayalam. His previous movies like Vellinakshatram, Aakasha Ganga, Albhuthadweep and Athishayan were made with giving much importance to graphics. As the director does not give compromise to perfection, Little Superman 3D too would be a visual treat for movie enthusiasts. So what has Vinayan stored for his young fans? Let us wait for the next Vinayan magic.